Bathrooms are no longer just functional rooms with harsh light and cold tile, but have become warm, stylish, inviting retreats. This is often the only room in the house where you can lock the door behind you and just take a few minutes – or hours – all by yourself. Your sanctuary of relaxation deserves to be seen in the right light -and so do you. Like with all rooms we need to take a look at the activities in the room and what needs to be lit. One thing is clear off the bat: One single fixture in the ceiling or over the mirror won’t cut it even in a small bathroom. A good lighting plan asks for layers of light. We need ample task light for the vanity area for shaving and putting on makeup. 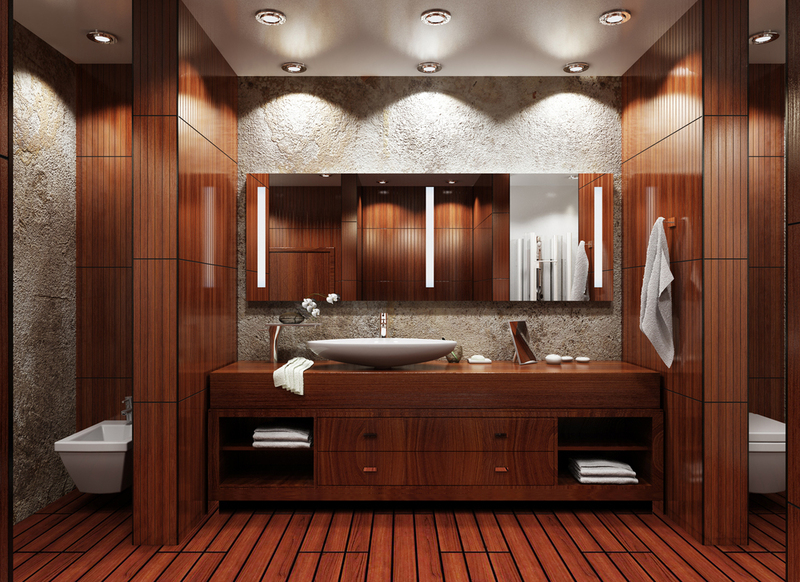 Ambient and accent light can then be added to soften the contrasts and make the bathroom “come together”. Good, functional task lighting is needed for the area around the vanity mirror and sink. The best vanity lighting surrounds the face with light. Light from that hits the face from above creates shadows under the chin, eyes, cheeks, and forehead, which add years to your age. Remember the flashlight-under-the-chin effect at campfires at a kid? – That’s exactly what happens, just in reverse. A scary thought and not a pleasant look first thing in the morning..
Wall sconces mounted on either side of the mirror or vertical strip lighting fixtures or are best for casting an even light across the face. Rule of Thumb: You want the center of the fixture at 60-66” above the floor and the sconces should be least 30” apart. With the size and positioning of some vanity mirrors, sidelights can, however, be a challenge. 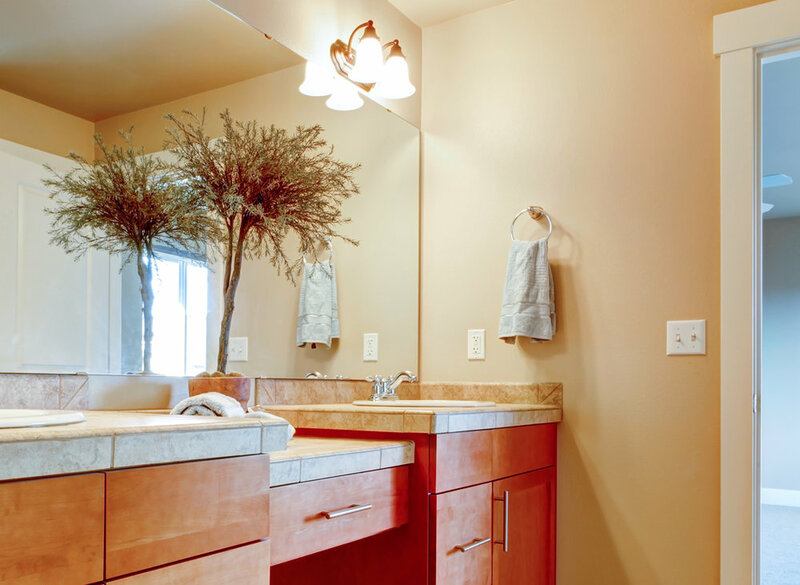 This is where a fixture placed over the mirror might be the only solution unless you opt for the elegant, but costly solution of mounting the wall sconces directly onto the mirror. A vanity light fixture above the mirror should be at lease 24" wide and be placed 75-80 inches above the floor so that the light will wash evenly over the person in front of the mirror. Do supplement the vanity light with other light sources to minimize shadows. Pendants are another option that works really well if there is no room for sconces at the sides of the mirror. Keep in mind that the pendants will show in the mirror, so you get a double view of them, so I usually like to choose pendants that are not too busy visually. A pendant lamp or a charming mini-chandelier can take the place of the more inconspicuous recessed down light and add sparkle or character to the bathroom. It is important, though, not to place it directly over the tub no matter how romantic the look is. Water and electricity just don't mix well and you don't want shards from a broken bulb in your tub. Even in a small powder room it is important to use more than just one light source for ambiance. A small recessed spotlight can be directed at a beautiful powder room basin or used to highlight the tile work and at the same time create another layer of light in the bathroom. 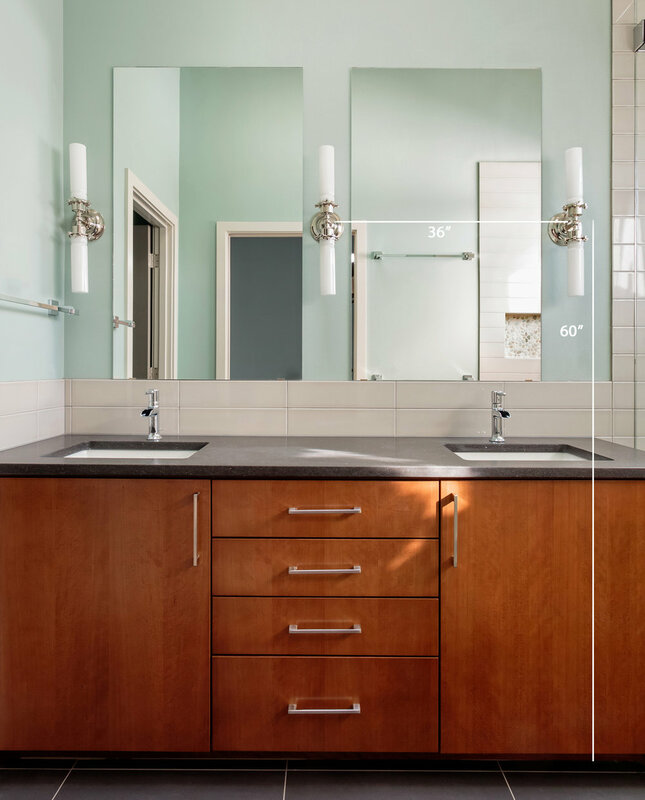 In smaller bathrooms a fixture may not be necessary in the shower stall itself, if it has a clear glass door – but if you can make it happen, it is a really nice detail. A linear fixture above the mirror or a fixture with several shielded bulbs will give sufficient light for grooming. Granted, it’s best with the light coming from the sides, but if you use a mirror that’s as large as possible over the vanity area, a long light strip will give a good amount of light and make the room appear larger. Think about using dimmers in your bathroom. They can make you control the light level in your bathroom from a gentle night light to bright task lighting when needed. A recessed wet location downlight in the shower or over the tub makes it easier to read shampoo bottles, and just adds a nice atmosphere. Show the Architectural Details If you are building or remodeling your bathroom you are meticulously choosing your stone, tile, flooring, paint and grout. You are hauling samples back and forth, asking everyone’s opinion, You are agonizing over color choices like “Winter Surf” and “Beach Glass” and FINALLY it all comes together. NOW SHOW IT OFF! You’ll be amazed how different the textures and colors look under different light sources! I am blown away when I see how many bathrooms are designed for looks only. Or for that matter, how many designers appear to hate light fixtures. So many bathrooms, especially of the luxury minimalist flavor (which I generally adore) only have recessed downlights over the sinks and vanity. Looks elegant, of course, but now think about the illumination you get when you are lit from above. Who in their right mind would want to highlight the bags under the eyes, the wrinkles etc.? Of course a backlit mirror is better than - no lighting at all. Just wait until the sun goes down. The bathroom below is beautiful, but the harsh shadows and scallops from the recessed lights placed too close to the wall are distracting.